← What Price Justice – The demise of Probation? When it comes to the American War of Independence, the UK and the USA are two nations divided by a common history, although a general consensus has emerged regarding British incompetence. Professor Andrew O`Shaughnessy has attempted to address this and in doing so has written a beautifully balanced book. It contains ten biographical subjects, George III, Lord North, Sir William Howe, Admiral Lord Richard Howe, John Burgoyne, Lord George Germain, Sir Henry Clinton, Lord Cornwallis, Admiral George Rodney and John Montague. There is significant interplay but remarkably no repetition of detail, in a well crafted and riveting book. 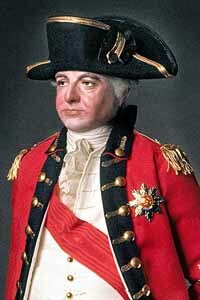 There are many compelling cameo roles outlined by O`Shaughnessy, such as those played by Benedict Arnold, Major John Andre and Banastre Tarleton. Andre is captured behind enemy lines wearing civilian clothes; the penalty for this is death by hanging. He asked to be shot instead in keeping with his status as a soldier. His request denied, his execution at the gallows described with genuine pathos. The British gained a major propaganda coup over the treatment of Andre but as O`Shaughnessy points out, they behaved in a “very similar manner when General Howe had executed the Patriot Spy Nathan Hale without even granting him the board of inquiry that Washington gave Andre.” As this observation makes clear O`Shaughnessy has not produced ten hagiographies, even though chapter eight is titled, ‘Saint George` dealing with Sir George Rodney. Rodney`s treatment of the Jewish community in St Eustatius is highlighted. The men who lost America also held onto “Canada, India, Gibraltar and the British Caribbean…at the death of king George III, the British Empire comprised one-twentieth of the global population, and was already the largest empire in history, upon which the sun never set.” This was empire building which brought with it the risk of invasion. In such an extreme situation the British were forced from the start to demonstrate creativity in a range of policy areas. In 1775 Lord Dunmore for reasons of military expediency issued his famous proclamation. This promised any slave (held by a rebel) freedom, if they joined the British and it`s estimated that anything between 80,000 to 100,000 did this including Henry Washington (escaped from George Washington in 1776) and Ralph Henry (opting for liberty rather than death and went over to the British). The British did not free the slaves of American loyalist, a point made by O`Shaughnessy, indeed these people were instead relocated to an even more hostile environment in the Caribbean and Bahamas. “Britain at the time was the leading slave-trading nation in Europe and ruled over 400,000 slaves in its own colonies in the Caribbean, where the slave codes were generally harsher and mortality rates higher than in America.” It also happens to be the case that while the grandees of the American Revolution sat reading Rousseau, Hobbes and Locke they exploited slave labour. This is comprehensively explored by Simon Schama, in his magnificent, `Rough Crossings`. As O`Shaughnessy makes clear this policy (of liberating slaves) was not universally popular among the British, Banastre Tarleton for example was strongly opposed, his family obtained a great deal of its wealth from the slave trade. Tarleton would later lead the campaign against abolition in London. Sir Guy Carleton on the other hand, adopted a more honourable approach. This evident in 1783 when he negotiated with George Washington regarding the terms of the British departure. According to Schama, article 7 of the Paris Peace Treaty stipulated that the former slaves (described as property) should remain in America. Washington pushed for recognition of article 7 but was repelled by Carleton who told Washington “I wish my dear General I could oblige you but they are all free and they are coming with us.” Clinton argues O`Shaughnessy, continued to stand up for loyalists after the war. We are told he introduced African-American, Thomas Peters then in London, to William Wilberforce and Granville Sharpe. And Clinton supported two petitions made by Peters to Secretary of State William Grenville. Britain was isolated as it effectively fought a world war against France and Spain while trying to hold onto America. This overstretch neutralised the British navy. Think 1940 but this time the British are the bad guys. The inscription at the front of the book from Thomas Paine sums the situation up neatly. Written in 1774 the words illustrate that there was no military solution once the British lost the political initiative. One of the key motivations behind the American Revolution was the belief that George III had usurped the British constitution and had become a tyrant (most of his time spent persuading people not to resign). O`Shaughnessy argues the king was actually the embodiment of the age of Enlightenment. Pointing out that (initially) those who sought separation from Britain wished to maintain the link with the monarchy. This position does seem rather analogous to the often derided pro-monarchy stance of the SNP today. Contrary to contemporary criticism, a pro royalist agenda may have firm separatist credentials.